Has it been a while since you replaced your furnace filter? Putting a clean filter into your furnace keeps the unit running efficiently and can keep dirt, pet hair and other debris from circulating back through your home. Furnace filters are easy to change, making this a quick, painless home maintenance task you can handle on your own. Inexpensive basic filters should be changed every one or two months. High end filters with advanced designs can often go several months between changes. If you have a reusable electrostatic filter, you can reuse it indefinitely. You just need to rinse it with a garden house every few months to keep it clean. An even better indicator than time is the appearance of the filter. If you pull it out, you can quickly see whether or not it needs to be changed. You can see the dirt, pet hair and other particles on the filter. If it looks dirty, it's time to either replace it or clean it. This seems like an obvious step, but you need to find out where it is before you can change the filter. Shut off the furnace before you touch anything on it as a safety precaution. The filter goes either inside the furnace itself or inside the return air vent. You'll usually see a service panel that you can remove, which reveals the filter. Check your furnace manual if you're not sure where it's located. Now that you've found the filter, look to see what type of filter it is. Disposable filters usually have cardboard frames. 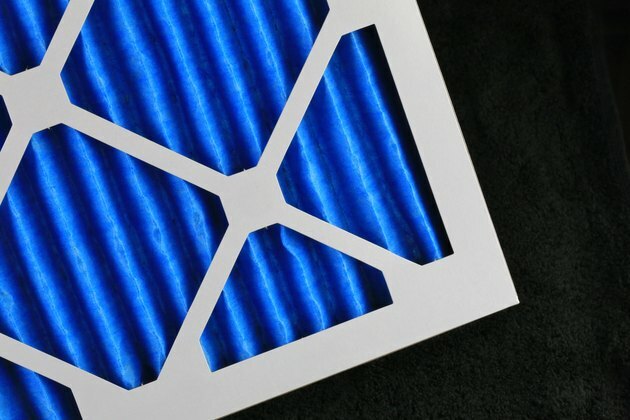 If the existing filter has a plastic frame, it's likely a reusable filter, which you can clean and put back into the furnace. The frame of the existing filter should show the size, which can vary from one unit to the next. You can also check the furnace manual to figure out what type and size of filter you need. The thickness is also a consideration. Furnace filters usually range from 1 to 2 inches thick, but some can be thicker. You have your new filter in hand, and you're ready to handle the replacement. Make sure the furnace is off. Pull out the old filter and make note of how it goes into the slot. Your old filter should have arrows showing which direction the air flows. This can help you insert the new filter the same way. If the old filter is really dirty, the debris may be clumped on and can fall off, so have a trash can handy to dispose of it easily. Remove any protective packaging from the new filter. Slide it into the filter space from which you just removed the old filter. Make sure the arrows on the frame point the same direction as the previous filter. Close the service panel, and turn the furnace back on. It now has a fresh filter that's ready to keep your HVAC system running efficiently.